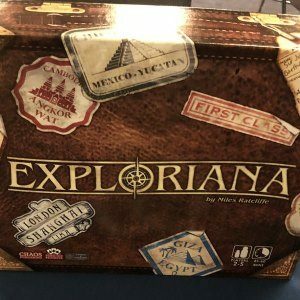 Exploriana is a new game developed by the owners of Bristol gaming cafe Chance & Counters, bringing the ideas of pushing your luck and set collecting together to form a family-friendly, easy to learn game that will sit nicely either at the start of a longer night of gaming, or in the collection of someone who enjoyed their games slightly less complex and lengthy tha nother games similar to this on the market. While the concept of pushing your luck isn’t a new one, Exploriana does a good job of giving you a theme strong enough to make the game feel new and interesting. But enough of the generalisations, let’s see what’s what. One thing I won’t comment on is the quality of the components in the box. This is a mid-production, pre-Kickstarter version that the guys at Chance & Counter sent over for us to look at so while the art style is one which will likely be kept (and I hope it does, because it’s really nice) the actual board, pieces and cards might be subject to change. But despite that, everything else is fair game for comment, including the main sequence of play which is incredibly simple while still being able to build some decent tension throughout. The first action in each round is an auction, where each player bids once on an item that’s been selected by the first player. These are handy things to try and grab such as binoculars (which let you look at and rearrange the top few cards in a pile) or a carrying case which lets you pick up more cards later. There are loads of these, and deciding whether to splash the cash and outbid other players for a bit of help is often a tricky choice to make. Not only that, because each player can only bid once the opening bidder is at a huge disadvantage, or so it seems. In reality, you can play some games with the other players, tricking them into thinking you want a particular item so they waste their money and leave you free to bid on something more useful. It can backfire spectacularly, but it’s certainly a strategic option. Once the bidding has finished, each player chooses where they’ll go exploring then take it in turns to turn the cards over on each continent. You can turn over up to three cards, leaving five on the board. If you make it that far you get two selections (between taking all the animals, one non-animal card or a lost explorer, which frees up space for your own explorers later), but that involves hoping you don’t stumble across some hazards, and if you end up revealing three separate hazards on your travels (as seen on the image below where you’ll see an icon for a rockfall, animal attack and wrong turn in the bottom corner) you get lost and don’t win anything. Bummer. What makes matters even more tricky is that as you get lower down the board the continents offer bigger rewards, but with much higher risk. In the Far East for example, the hardest region, only three cards out of 18 are free of hazards, while South America at the top only contains 15 hazards across its 24 cards but offers smaller point tallies along the way. As such there’s always that agony of choice from this push-your-luck mechanic of whether to take a single card or risk it in the hope of grabbing two. All cards are worth points at the end of the game, but there are a few ways to really hit the big scores. Collecting sets of orchids together (whereby you have one of each of the three types) gets you a decent sized lump of points, and the more maps you can unearth the bigger your reward is from those as well. 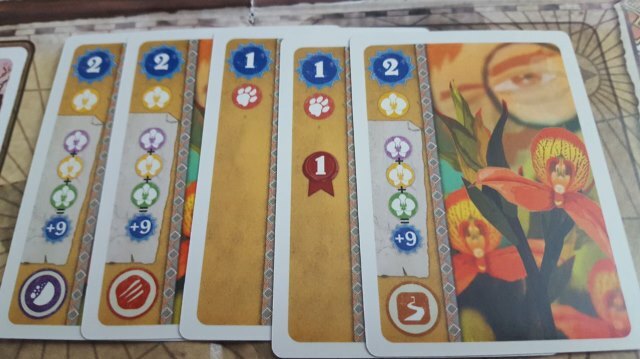 As such there’s that tricky moment of deciding if to risk another card turn in the hope you’ll complete a set of orchids, or leave it and make do with a lion. All the while others on the table are egging you on, trying to persuade you to go for broke in the hope that you’ll run out of luck and end up lost with no reward. And really, apart from one or two other smaller rules, that’s all there is to it. It’s such a simple game to play that you’ll only need to run through one round of the game to explain the rules and 10 minutes later you’ll be playing for real and trying to get your mother-in-law to get attacked by animals. It’s such an accessible game, and while the mechanics involved are very well established and done before the theme of exploring feels really great, and discovering new stuff to add to your collection is a really nice moment. 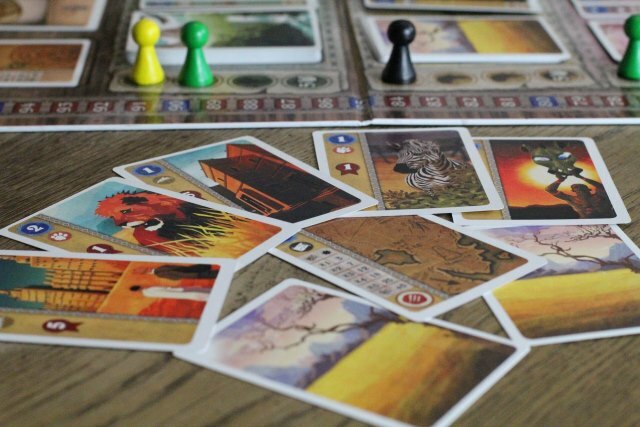 It would be nice to have more variety in the cards, and whether that comes through the Kickstarter campaign remains to be seen, but overall this is a really nice game and sitting at the backing price of just £30 is well within the range of picking it up to see if it’s a game for you. But generally, it should be. I’ve played this with several people now and the outcome has always been the same: we’ve had fun, we’ve had a laugh and we’ve promised to play it again next time we’re round the table together. So all in all, that’s a pretty sound endorsement. You can back Exploriana over on Kickstarter right now – hit the link to do exactly that!